Guest Blog: Filling the Stoner Void. It is a sad state of affairs that every time we see the news there is more tragedy and controversy. It seems to make my worry over MotoGP’s future seem somewhat irrelevant and insignificant, but the truth is that it this passion and commitment to a sport or an athlete that makes us human. Like so many other we writers’ have suggested before, it is this passion for sports that in some form have replaced the former clan and county rivalry etc. and although I would love to say war, we all know that not to be true. 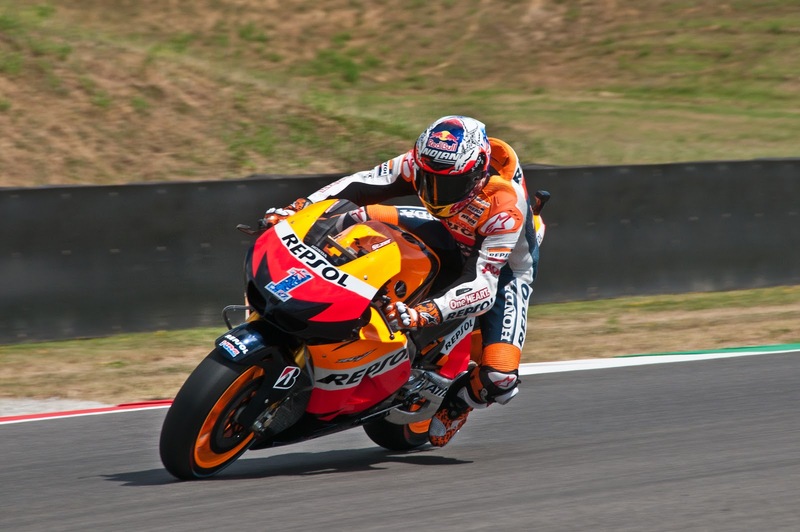 Before I get too political or theological, I think we need to focus on the issue at hand, how is the void that Casey Stoner’s absence has created, going to be filled? Casey Stoner has been criticized his entire racing life for his attitude towards media, promo work and for being honest, brutally honest, but when you look at there individual riders in the MotoGP paddock, he is unique, a rider like no other, in every sense of the word! His skill, speed and talent are unmatched, as the last 2 years have undeniably been proven, but more so his ‘persona’. No other rider was more vocal against Rossi. No other rider was so blunt about the bike he was riding or the conditions of the track. Who in the now current field will be able to fill in such a hole? So many people loved to hate Casey, they called him a moaner – this is where his honesty was misunderstood. Who are they going to love to hate now? Lorenzo? Many people have disliked him in the past, especially with his victory winning antics as he battled against Rossi, but he is a much calmer person now, he has settled, matured even. He rides with a consistency perviously not seen before, but it was Casey’s backing it in and sliding the rear as he rode round corners etc that made his riding so awesome to watch. Lorenzo is technically perfect, pulling off lap after lap of times within thousandths of each other. A great achievement and a very special talent, but let’s be honest – somewhat dull as a viewer. Who are the Rossi lovers going to boo as they walk on stage? Casey copped so much booing from crowds, its no wonder he hasn’t got that much time for the crowd! So who will they boo now? Lorenzo has matured and is No. 1 at Yamaha and there will be no wall between him & the 9 time champion, so there is little ammunition for these fans to get their knickers in a knot over? Maybe more will happen later in the year but unless there is some really dramatic racing like in Motegi of 2009, which I honestly think Rossi will be more capable of next year. Let’s take a look at the new riders and CRT riders… Edwards is a character but his humor and antics will rarely be seen on track as he languishes at the bottom of the field, Espargaro and De Puniet are very pleasing to the media and again, not exactly controversial personalities! So therefore the hole in which Casey has left, will need to be filled in every way shape and form by Marc Marquez. Pressure much? Fill the space for riding technique, style and thrill factor, fill the space in the media with brutal honesty and controversy, fill the space of the character the fans love to hate and hate to love! Marc Marquez is riding for Honda and I think that history has shown that they prefer calmer more quieter riders who go out and do the job and please the big bosses. It is true that Marco Simoncelli did not fill that mould – but he was riding for San Carlo Gresini – not a factory bike in the sense of sponsorship and even then after the Simoncelli/Pedrosa incident it was clear that he was ordered to calm it down. SO… where does that leave me? Depressed… I miss Casey already! Just knowing that he won’t be riding brings a wave of disappointment over me and sadness, the sport has lost an incredible asset, one I think that they will not truly appreciate until later in the year. I estimate a total weekend attendance at the 2013 Phillip Island round to be half of race days attendance of 2012. I have to be honest, I doubt I will go, and I have been going since 06 when Casey rode for LCR! Perhaps instead of filling the void, someone like Marquez can shape and mould the void into his own space within the GP Paddock. I am a great Casey Stoner fan and agree that no-one can or ever will fill the void he has left. I loved his brutal honesty, his hatred of the press, but most of all I loved his “wreckless” way of riding every bike he has ever ridden. I, too, miss him already. Big shoes to fill! Rossi fans hated any rider that dared to challenge rossi dominance. Max sete then casey was the first to get the job done! And on a Ducati that has always been regarded as a mid pack pig! Rossi when he moved the to Yamaha improved the handling but was still underpowered! We should all agree that a bike that handles almost everytime is the bike that wins the title! The fact that the world was finally exposed to the talent that's out there other than Rossi is what drove the Rossi fans crackers! The riders say casey changed the way they attack the track! Please provide an example of this alleged 'moaning'. Some people say the wind moans, but Jimi said it 'cries Mary' … Watching Casey Stoner at work at Phillip Island was a very special privilege. He flirted right on the edge of control. No other rider came close. I agree with Helen. The Cowes coffers will be empty this year. as a ducati man, we'll be eternally gratefull.. I remember when Casey arrived in the UK and won Aprilla Superteen races by huge margins. It was obvious he was special then, and let's be honest, he was the only rider who could perform on the Ducati. Melandri had a mental breakdown trying to keep up, and he is a good rider. Rossi went to Ducati to make an Italian dream team, and we all looked forward to that, only to see what we thought was the world's best be comprehensivley humbled. Casey was as good as Valentino, enough said. Rossi and his fans still fear Casey even though he is gone, they fear being reminded of just how good Casey was and how he could beat their GOAT on a bike not even their GOAT could ride. Casey had only one problem…. he was just too dam good. I'm not an Aussie, I like Motogp, WSBK, BSB, Road Racing. The only Motorcycle Racer I have ever disliked is Stoner. A fast rider on any Bike on any Track, give him Pole Position & he will Win the Race, put him back the grid or in amongst other Bikes unable to make a Pass on a Faster Bike on a Straight then he is not Guaranteed the win. This makes him a one trick pony & a Boring Moaner, I don't need anyone to hate, just close Racing.